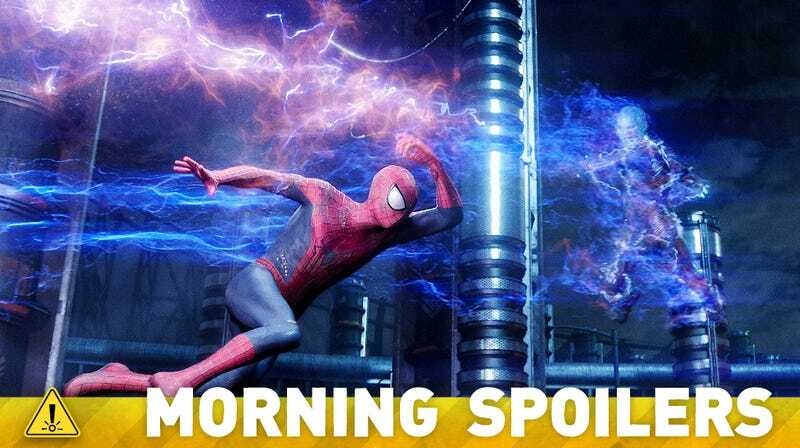 Could the Amazing Spider-Man movies really set up the Clone Saga? Breaking Bad's Jesse Plemons might be playing a very crucial Star Wars character. Sony might be looking for a director to bring the Masters of the Universe film out of limbo. Find out who could be playing Kyle Reese in Terminator 5. Damon Lindelof hopes that character trumps mythology in The Leftovers. Plus, sneak peeks at tonight's episodes of Intelligence and Sleepy Hollow! Spoilers now! I'm sure it's going to be great, but they don't need me... I think there's a whole new cast and a whole new look at things, and I think that's great. As I said, I'd never say no, but I wish them [well]. Meeting Mackie's character, he used to serve, now he works at the VA counseling guys who come home with PTSD — they connect on that level. I think they're both wounded warriors who don't bleed on other people. Cap has no one to bleed on. I think Mackie knows how to handle people like that. … Sometimes when things are bad, trusting a stranger is the way to go. Manhattan's Empire State University announced a new class for the 2014 fall semester in advanced biogenetics that will actually require the successful cloning of a living creature. Introduction to Live Cloning, taught by noted geneticist Professor Miles Warren, is the first class of its kind anywhere in the world. When asked about the ethical aspects of teaching a class on how to clone living cells, Warren said, "Our responsibility is to educate our students and prepare them for life. For those who study genetics or biology, cloning will be a fact of life." The ethical aspects of cloning are irrelevant to Warren, who added, "We are cloning single-celled amoeba. Maybe one day we'll work our way up to mice. There is no ethical dilemma. Save your red flag for when I start cloning co-eds…"
Hopefully what you're going to care about when you watch the show more and more is how are these characters are basically dealing with this situation in terms of living in this world and interacting with each other and less about what happened and where everybody went and why. I don't want to say whether we're going to do that ending or not on the show, but I can say the ending in the book is not the ending of the series. We'll be moving past the ending in the book fairly quickly in terms of the life of the series. There's no parrots — that was easy. It's not interesting to see a guy walking around with a peg leg. But it is interesting to see a guy lose his leg in the course of the story and how that happens and the consequences of that. Visually I think we're trying to create a world that doesn't feel like a cliche. They're not in this for an adventure every day, they wake up and go to work to survive. If viewers come to it expecting Jack Sparrow, that's absolutely not what you're going to get. He's a survivor. They're at the edge of the world, really, and they're surviving the best way they can. He's got a very cool analytical mind and he's planning way in advance. Most of these pirates live day by day, but Flint has a bigger plan. He's going to try and liberate these pirates and give them a safe place to be where they can defend themselves against the Spanish and British without fear of being kicked out. But the way he does it isn't necessarily the right way. He's got this burning purpose to free the pirates yet he will stop at nothing to achieve it.